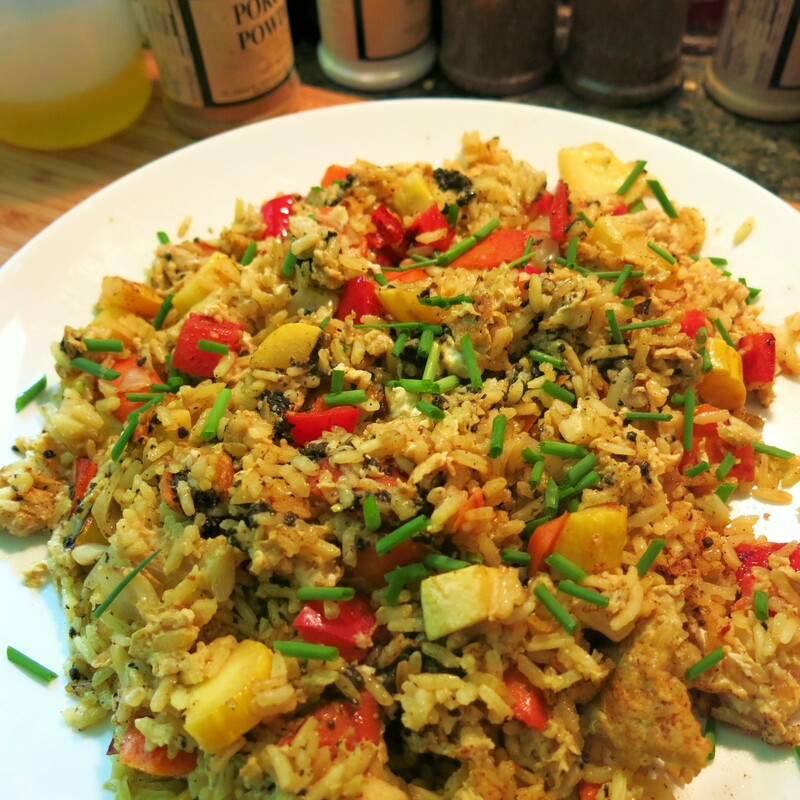 This is one of those totally self-indulgent dishes…well, self-indulgent for me. I love fried rice. White rice you can keep, except to act as a nice fluffy, feather bed to be blanketed with a great sauce. This is a version of an after-work meal that I dream of. It’s the sole reason The Goddess makes extra rice. 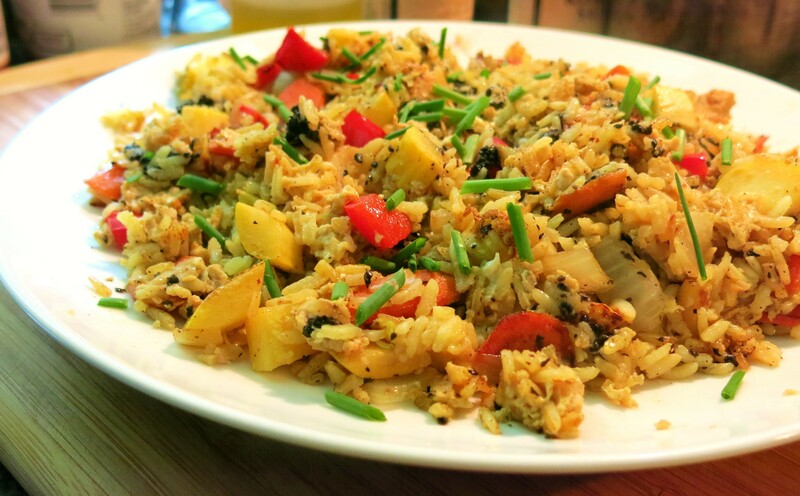 This version of the ubiquitous fried rice that’s on every Chinese take-out menu, only has its roots, or maybe it’s big toe, in the Asian sphere that is fried rice. 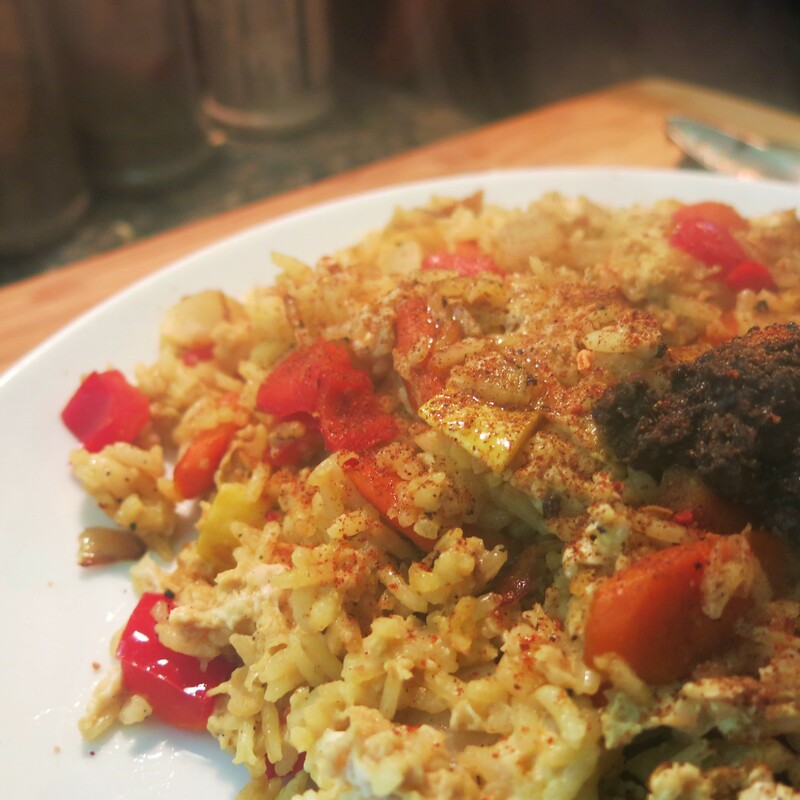 Have I mentioned that I love rice and fried eggs together? They are a natural. Some highly seasoned…read “heaps of garlic” rice, with a couple of fried or better yet, soft poached eggs on top…Are you picking up that sauce angle yet? But this is a one-pan-wonder of a dish. It takes about 10 minutes start to finish, 15 minutes if you stop to take a boat-load of pictures. The key to this being a “quickie” is to have everything ready before you heat the skillet. First, I break 2 eggs into a bowl, add about 1 tablespoon soy sauce and Shaoshing Chinese rice wine (use sherry, if you don’t have the rice wine) and a big pinch of red pepper flakes. I beat that all up and set it aside. Next, I slice a carrot, dice some bell pepper (I had a red one this time), yellow summer squash and onion (you seriously thought there would be no onion! ), very thinly slice 1 or 5 cloves of garlic, get out the cold or cooled rice and my skillet. 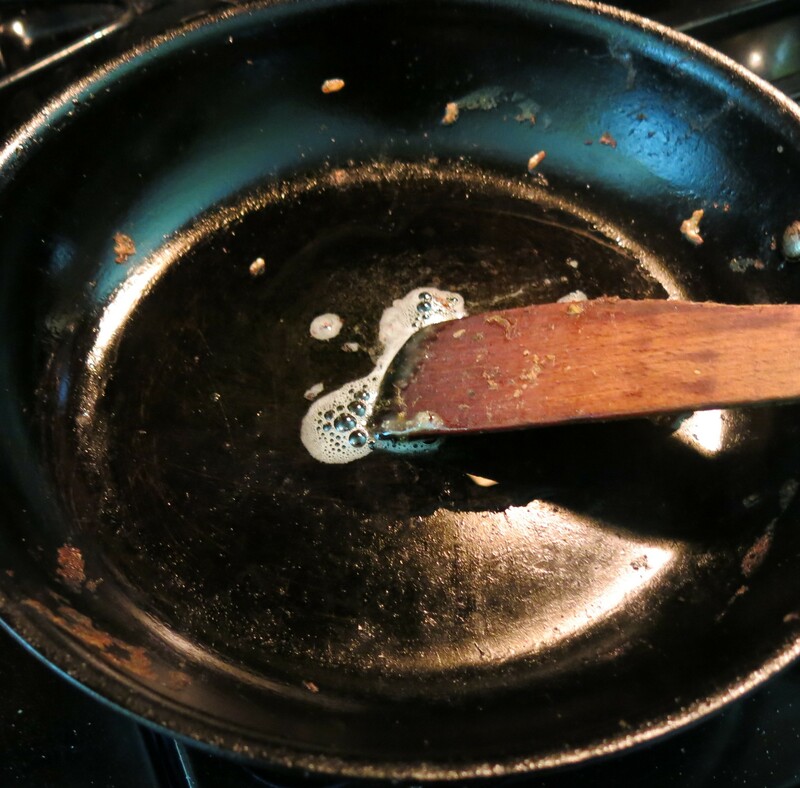 I use about 1 tablespoon of bacon drippings, not oil. That’s right, The Goddess has a nice big jar, sitting right near her stove that’s almost full-to-the-brim (most of the time) with what my mother and her mother before her called “flavor”, or bacon grease. I’ve taken to calling it “bacon drippings” because most people recoil when they hear “grease”. Then visions of heart attacks and IV tubes flash before their eyes…it’s ugly and this isn’t. If you feel really strongly about it, use the oil, but that elusive bit of smokiness and flavor won’t be there. Anyway, this is my indulgence, not yours. The Goddess doesn’t eat this every night, though she may start; she did have the leftovers for breakfast…hmmm…. Well anyway, get your skillet nice and hot, toss in your fat of choice. Make certain the fat is hot, then in with the carrots. 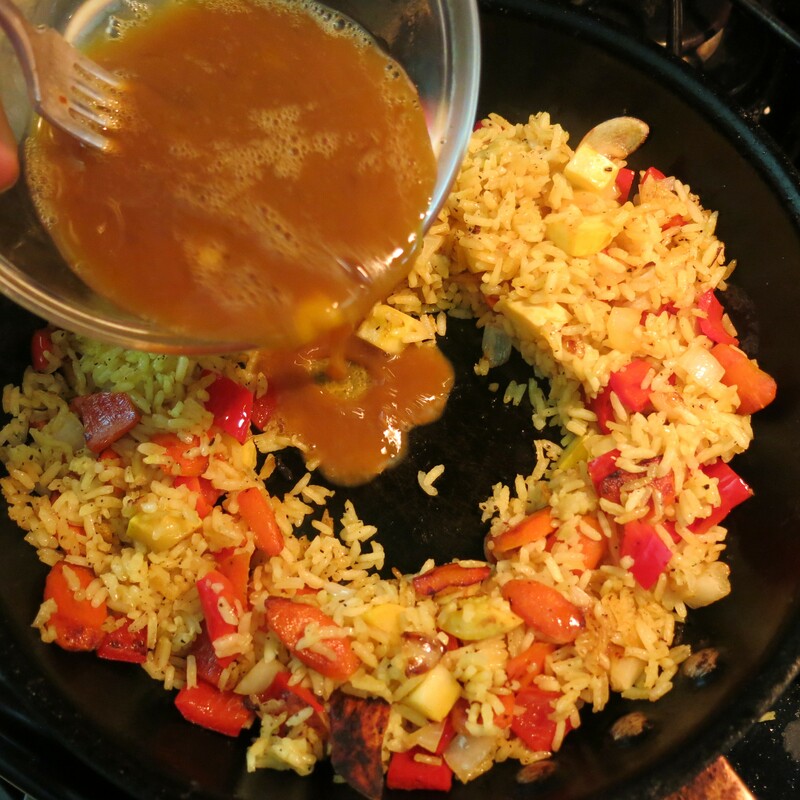 I usually just flip the pan to move everything around, but I only flip it once or twice because I want the veggies to pick up some caramelization, and they need to do that quickly, about 2 minutes. So hot pan, hot fat and not much movement—will get us the “YUM” factor we want. Now it’s time for the rest of the veggies, so in they go. Again, flip them once or twice; about 1 minute here. I don’t care as much about caramelization with these than I do with the carrots. Now, dump in the rice, spread it our with a spatula, or just shake the skillet until it evens out, then leave it alone for 1 full minute! Now flip if couple of times, and repeat for 1 minute, yet again. We’re ready for the egg mixture. 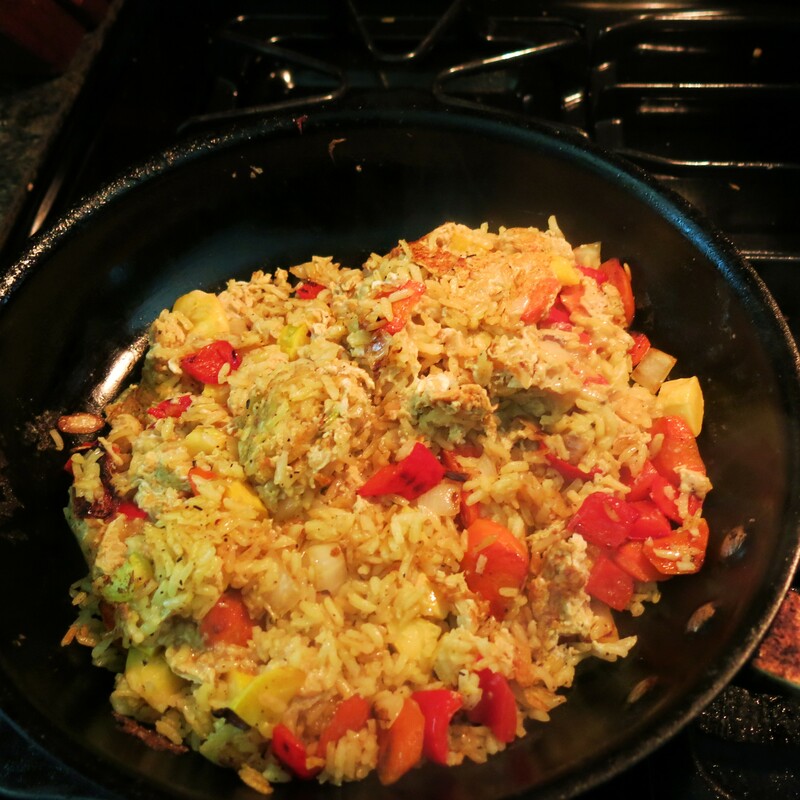 Push the rice mixture to the edge of the skillet making an open well in the center. Then just pour that already-beaten egg mixture into the center. Leave it for 30 seconds, then using the fork you beat the eggs with, move in a circular motion to remove the eggs from the bottom of the skillet into the liquidy part. See those little clumps of cooked egg? Repeat the “scrambling and leaving for 30’s seconds” part 2 more times, until them mixture looks like this. Then push the edges of the rice into the partially scrambled egg mixture, like this. Do this in about 3 or 4 places. The idea is to just get the eggs mixed into the rice. Don’t worry too much if it is particularly even. Now, leave it alone for 1 minute. Sprinkle about 1/4 teaspoon porcini mushroom powder over the rice, just a nice dusting. Toss the rice and repeat once. See the “clumps”of slightly browned egg/rice mixture? That’s what I’m look for. That’s how I want this to be. For The Goddess, that’s part of the indulgence. Dump the mess out onto the plate, drizzle with some truffle oil, about 1 teaspoon, stir it in and enjoy! The picture seems a tad blurry; that’s steam coming off the dish. 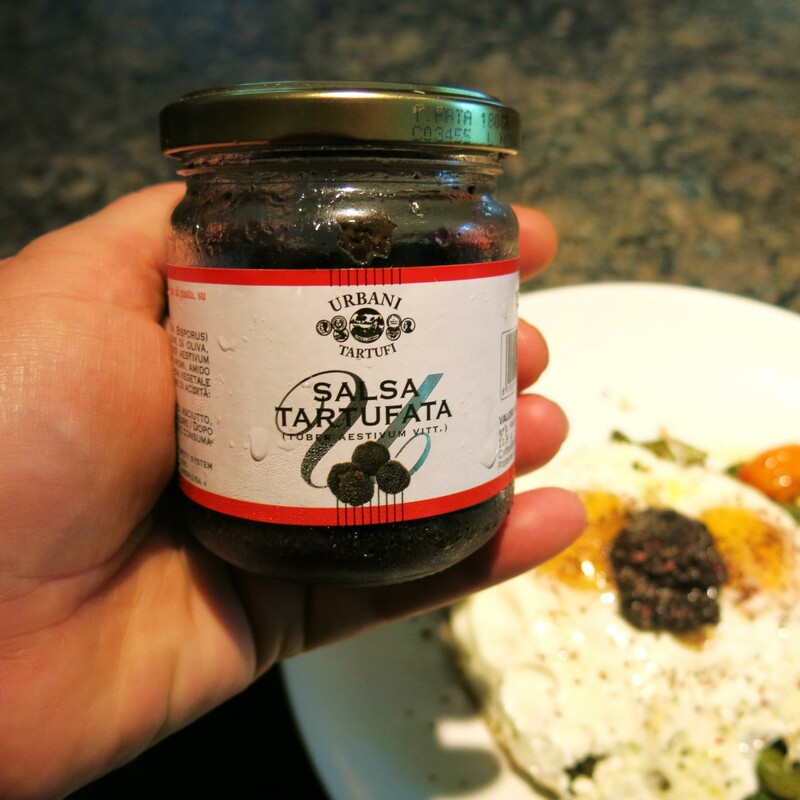 You can also see, over on the right side, a blop of salsa tartufata or mushroom paste from Italy. Most brands are composed of a combination of porcini and truffles; some add olives and capers, too. You can buy it in any good Italian market, and when you find it, buy it. You won’t be sorry. It is superb spread on plain crackers, tosses with pasta, on an old shoe and with eggs and rice (see in the background of the photo). I don’t always use this, but I had an open jar in the fridge and The Goddess, she was feelin’ the need. I stirred it all together, tossed on some chives and savored every last bite…well really only about half and then I enjoyed the rest for breakfast today. It’s a good day! 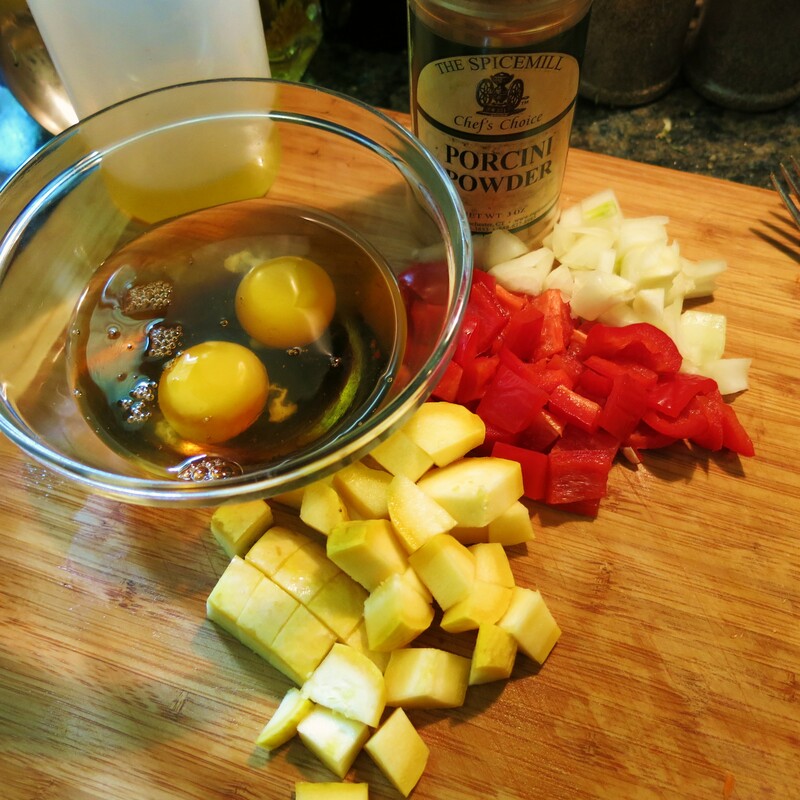 Combine the beaten eggs with the soy sauce, hoisin, if using, sherry and red pepper flakes. Set aside. 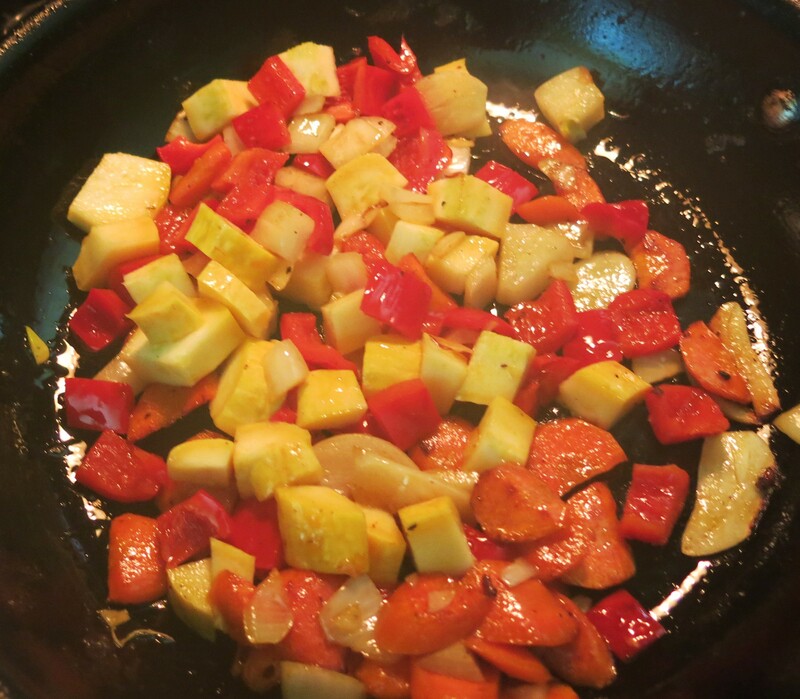 Preheat a large skillet or wok to medium-high heat. Pour bacon fat or oil in the bottom. 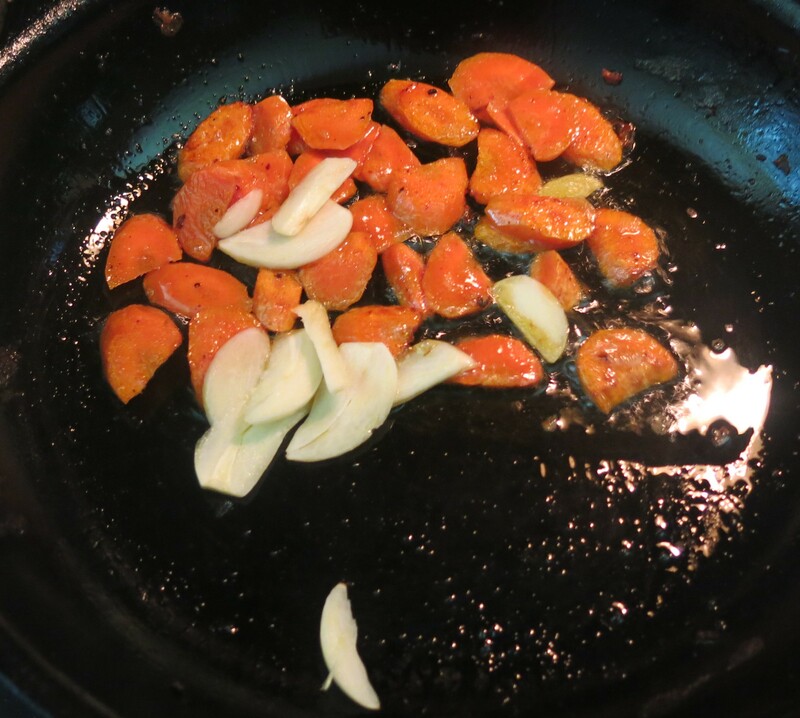 Add carrots and fry for about 1 minute. Add the sliced garlic, flip or stir; fry for 2 minutes, flipping after 1 minute. Add the onion and peppers; stir to combine. Fry for 1-2 minutes, flipping 2 times. Add the rice; stir to combine. Continue to cook for 3 minutes, stirring or flipping 2 times. You want the rice to brown just a bit. Push the mixture to the sides of the pan, leaving the center bare; about a 4-inch area. Pour the beaten egg mixture into the center; let stand for 30 seconds. Using a fork, stir to remove the cooked eggs from the bottom of the pan, partially scramble the eggs. Repeat 2 more times. 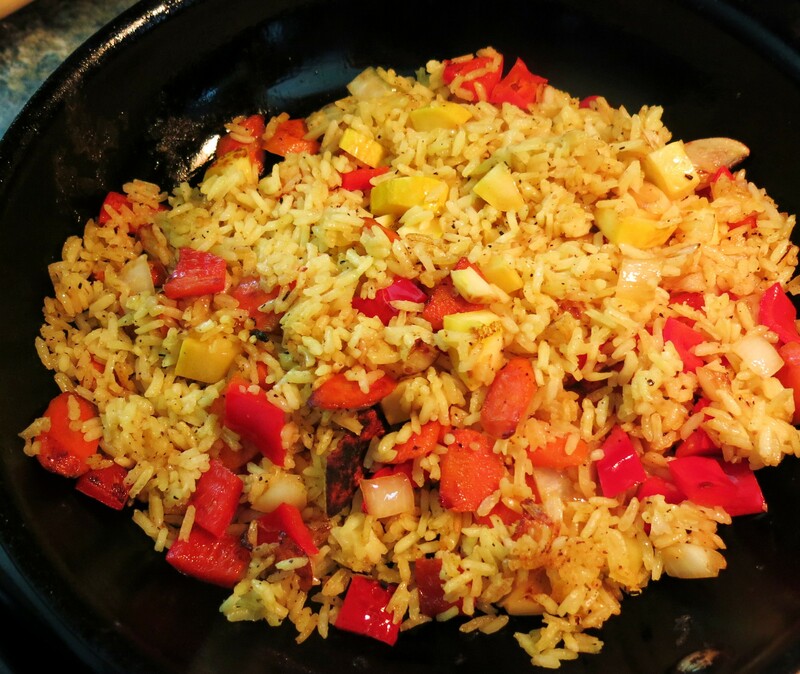 They will still be moist and only partially cooked; stir the eggs, peas, if using, and porcini powder into the rice/vegetable mixture, by drawing the rice from the sides of the pan into the center. Even the mixture out by gently shaking the pan. Allow to cook for 1 minute, turning the mixture, even it out and leave 1 more time. Pour the mixture out onto a large plate. Sprinkle with the green onions, if using. Drizzle with truffle oil and sweet soy and/or hoisin sauce, if desired. Dive into bliss! NOTE: All the proportions can be altered. 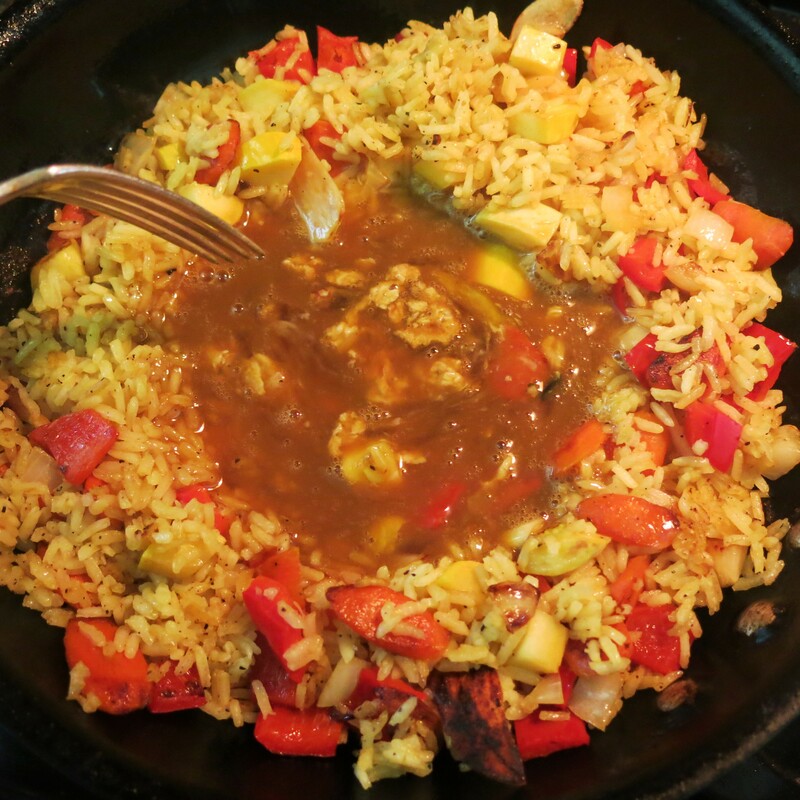 You can add any number of vegetables or use only mushrooms and onions…just keep the ration about 2 or 3:1 rice to veggies. 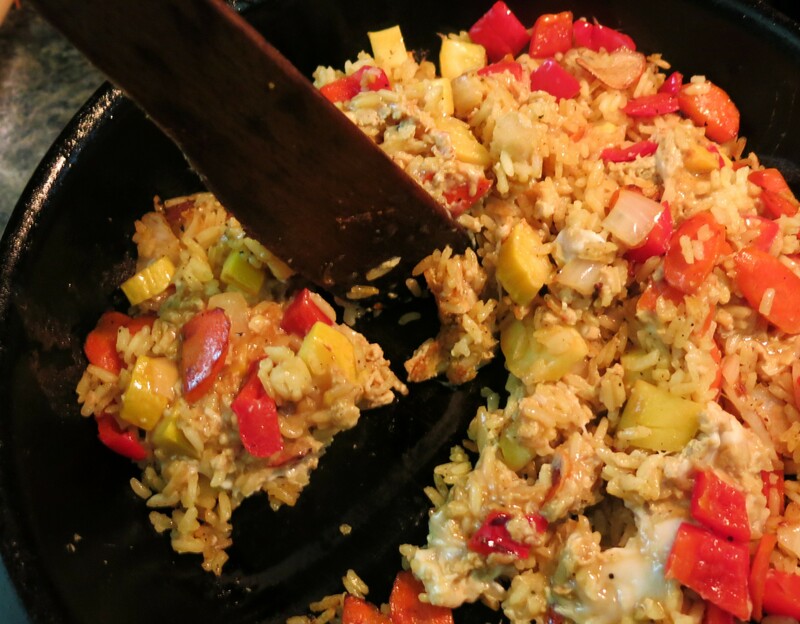 Self-Indulgent Fried Rice Recipe©Marcia Lahens 2015. All rights reserved. I adore truffle anything. But truffle oil, either black or white, owns a stellar place my kitchen. It is excellent with most starches, including popcorn. Great with eggs, many vegetables, and proteins, too. However, in the last couple of years, there’s been truffle on, in and around everything. I do love the stuff, but enough already. Food world, move on the next big adventure and leave us to savor this deeply, warmly and only occasionally. Truffles should not appear in ice cream or rice pudding, okay? This is a meal unto itself. 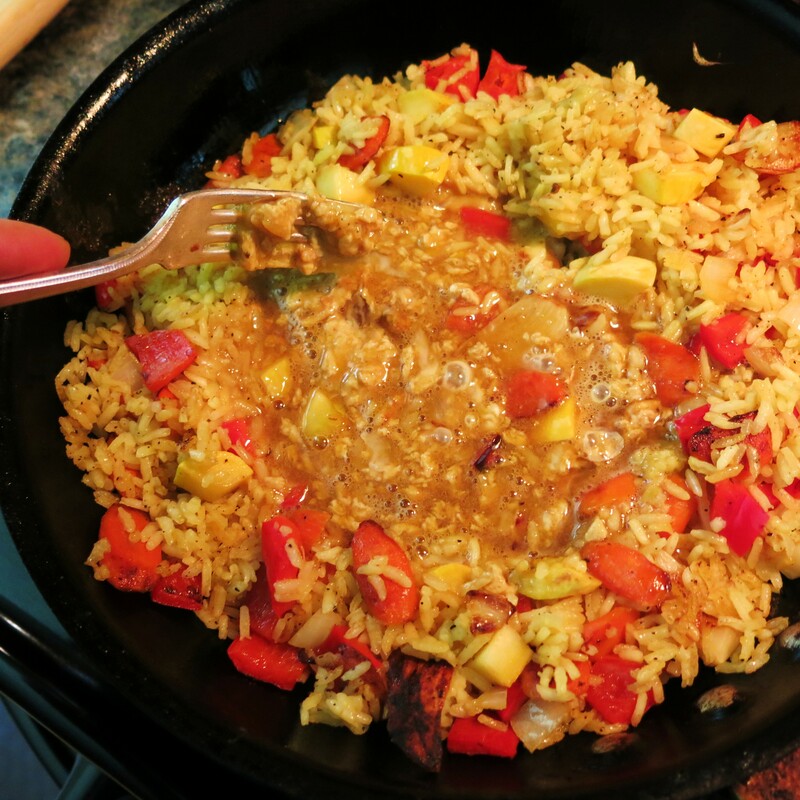 It has protein, vegetables, it’s filled with flavor, it’s fast and easy to prepare, can use leftovers, if you need to and it just tastes, well…it tastes self-indulgent. And sometimes that’s a good thing. A very good thing.